O Night Divine: Prepare the Way of the Lord! I have an internal struggle as I see all the posts and reminders of Advent and making Advent plans. I rebel interiorly, as I don’t like to overplan, especially for Advent. But as I’m thinking through what our family will do for Advent, I realize I need to solidify my goals, streamline my vision, and make plans. I have to plan a little so I can keep it simple. It seems a little contradictory, but it does make sense to me. If I don’t have some goals and plan in mind, we can be hit willy-nilly with all sorts of attractive activities, busyness of preparation, and then I will lose sight and control and be in the situation I always dread – over my head and just barely treading water. This is a pondering post, not one with lots of crafts and ideas. My thought process: What will be my focus or main meditation during Advent? And what will our family’s main focus be during Advent? What are the main points to be then be interiorized? When the Church celebrates the liturgy of Advent each year, she makes present this ancient expectancy of the Messiah, for by sharing in the long preparation for the Savior’s first coming, the faithful renew their ardent desire for His second coming (No. 524). Advent is a separate season from the Christmas season in the Church's liturgy. Advent is a time of hope, a time of preparing, a time for patiently and prayerfully waiting. It is not technically a fully penitential season, but purple as the seasonal color indicates celebration has not begun. The Advent Masses omit the Gloria, but retain the Alleluia. Christmas carols aren’t sung until Christmas. Christmas has an octave – eight days each one being another Christmas, and then the season lasts until January 10, the Baptism of our Lord. That is 17 days to celebrate the mystery of the Incarnation. The 26 days of Advent is the time to prepare. I want to convey that contrast in my home. Christmas doesn’t happen until December 25. Will we be “Christmased” out when it does arrive? It’s an uphill battle, because we are faced with the secularism of Christmas, or “Happy Holidays” before Halloween is over. We will have outside invitations and activities that mark Christmas celebration before the 25th. We will be hearing Christmas carols and seeing Christmas decorations and all those delicious-but-fattening Christmas goodies all through Advent. We aren’t trying to become hermits, living an austere life with no celebration. No, what we’re aiming to do is simplify and pace our family so that we will have energy for the true celebration of Christmas and the Christmas season. Our family needs to imitate Mary, in her preparation for Christ’s coming. Can we turn off the mindless hustle and bustle and replace it with Mary's active contemplation? She visited and helped Elizabeth, and then went home to prepare for Christ’s birth. At that time there weren’t gift registries or a baby’s bedroom to decorate, or a long list of items needed for an infant layette. Mary would have been weaving the cloth and sewing the swaddling clothes and diapers and blankets – all activities that are active work, but allow for contemplation. Can we imitate Mary’s spirit, even though we might have busier preparations happening? Can we imitate her humilty -- staying quiet and hidden, keeping all thoughts towards Him while Jesus grew in her womb? And how about imitating her spouse's humility? What messages to convey during this Advent to my family? Gifts – Giving, not about receiving. Charity for neighbor; practicing corporal and spiritual works of mercy for others. Advent, not Christmas – It is not Christmas yet. Christmas is celebration of Christ’s birth, Advent is preparation. The main thrust of our Advent traditions will include a new liturgical calendar, an Advent countdown calendar, preparing the manger, the Advent wreath with the four key figures of Advent with a little tweaking for this year. All these are simple and traditional, but always enjoyed. I have a few child friendly Nativity sets that I put out during Advent. Except for the Fisher Price Nativity, Baby Jesus will be absent until Christmas Eve. An activity we will add this year will be some of our crèche figures (Jesus and Mary and the Three Kings) traveling throughout Advent. We normally don’t decorate the house for Christmas until the 3rd or 4th Sunday of Advent, and we keep the Christmas carols and shows at a minimum until that point. The anchor will be the Liturgy from the four Sundays of Advent. Each Sunday in Advent will have a theme that we will try to keep throughout the week, incorporating it with our Advent wreath. The Liturgical Year pivots on the Paschal Mystery, which is commemorated every Sunday. Sunday “is the foundation and kernel of the whole liturgical year.” (Sacrosanctum Concilium, no 106). This is my main motivation, to reiterate that message that Sundays take priority. The fixed dates for the Optional Memorial of St. Nicholas and Memorial of St. Lucy fall on Sunday this year, so they are superseded by the Sunday Advent liturgy. I’ve already had questions from my son as to why St. Nicholas isn’t on the calendar this year. I do find this a teachable moment to explain the order of precedence for feastdays in the liturgical year. But since we do love these saints and the customs are part of our family tradition, I’m moving some of our reading and celebration of these two saints earlier in the week, so they don’t override our Sunday activities. We’ll continue doing school days, as we’ve fallen behind a bit with sickness and traveling. The main thing we’re adding to our lessons for Advent is reading, and some of the Catechesis of the Good Shepherd presentations (Advent prophecies, the Annunciation, the Visitation, etc. ), and Advent hymns, especially chant. I hope to post separately on both of those. We will begin with An Introduction to the Liturgical Yearby Inos Biffi, as this is the beginning of the new Liturgical Year. We will read the section on Advent in Part One during the first two weeks of Advent. The Way to Bethlehemby Inos Biffi will be for the second half of Advent, as we get closer to the actual feast of Christmas. 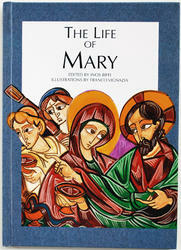 Both books cover the richness of the season reflected in the Advent liturgy. I also will include The Life of Mary for the feasts of Mary, particularly December 8, the Solemnity of the Immaculate Conception, and during the Fourth Week of Advent, when we're contemplating Mary. These books explain so clearly the Liturgical Year and the liturgical seasons of Advent and Christmas; they are the perfect catechesis for both children and adults. The text is wonderfully supported by the rich flowing illustrations by Franco Vignazia. I am so excited that these books are back in print. Michele shares my enthusiasm for these treasures, and is offering these books for sale at Family-Centered Press, which is extremely helpful since Way to Bethlehem is not available in the US. Having bought my copies piece-meal from different suppliers, paying shipping for each book, the Advent Book Package is an excellent deal! We will read a bit For some of the Old and New Testament saints, I’ll be using Ethel Marbach Pochock’s Saints of the Season for Children (or Saints in Waiting, both out of print) and her Around the Year Once Upon a Time Saints. These will be used as extra reading on the saints' days in Advent, and reading for the key Advent figures (Isaiah, John the Baptist, etc.). Do you want to accompany Jesus closely, very closely?... Open the Holy Gospel and read the Passion of Our Lord. But don't just read it: live it. There is a big difference. To read is to recall something that happened in the past; to live is to find oneself present at an event that is happening here and now, to be someone taking part in those scenes. Then, allow your heart to open wide; let it place itself next to Our Lord. And when you notice it trying to slip away —when you see that you are a coward, like the others — ask forgiveness for your cowardice and mine. I also like the historical/cultural information given at the end of each chapter. Depending on interest and time, we'll read this daily, but we might save it for next year. I'll post more on my plans and my reading plan for our picture books. This is already so long!